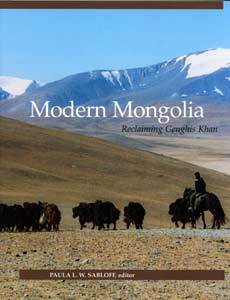 Modern Mongolia: Reclaiming Genghis Khan gives the reader an understanding of what life is like in a country that appears so different from the U.S. but actually shares ideals and goals. The book combines anthropological, historical, and personal accounts of a nation that was conceived by their thirteenth-century ruler Genghis Khan, born as a Soviet satellite in the early twentieth century and born again as an independent democracy at the end of the century. This story of modern Mongolia is richly illustrated with over 120 photographs (archival and new) and six maps. Chapter 1, an overview of Mongolian geography and history to the twentieth century, starts with the author's personal experience as a teenager watching her homeland emerge from Soviet control to an independent democracy. Chapter 2 recounts the exciting changes of the twentieth century from Manchu Dynasty feudal society and autonomous theocracy to Communist nationhood status and finally full independence as a democratic nation. Chapter 3 shows the effects of historical changes described in Chapter 2 on the daily life of Mongolian nomads - their clothing, family dwellings (yurts), and furnishings. Chapter 4 shows the connection between modern Mongolians' devotion to democracy and the political ideas of Genghis Khan. This book should prove useful and interesting to laymen, students and scholars alike. Written in a readable style but with scholarly references, the volume presents a Mongolian historian's conceptualization of her nation's recent history and an anthropologist's original research on the political culture of modern Mongolia, finding its roots in the lifework of Genghis Khan. The book presents a new view of Genghis Khan to a Western audience. Rather than view him as the scourge of Eurasia, the author presents evidence that he actually instituted the basic principles that led to easy acceptance of democracy in the twentieth century. It also makes accessible to English-language readers Mongolians' perspective on their recent history and culture. The book is available for purchase through Penn Press or you can drop by the Museum Shop.